Since our parents moved into New Hope less than 2 weeks ago, we initially thought we would wait awhile before writing a review. However, beginning with our initial and subsequent tours, numerous questions throughout the entire process up until today, we have been extremely satisfied with the knowledge, care(ing), professionalism, and individual attention paid to each parent. We visited many assisted living facilities in a 75 mile radius over several years so we were fairly educated as to what the industry could provide. What separated New Hope for us was the smaller resident population which allows the staff to really get to know each resident, their willingness to accommodate our requests, the staffs enthusiasm in encouraging residents to participate in activities based on understanding each residents' wishes and limitations, and the hope/expectation (since realized) that we adult children, all living out of town, could visit then return home and not worry about our parents safety and security one bit. The most important thing I could say to someone considering New Hope is to sit down with Rumi, managing partner, and have a conversation. If Dori, Kim, or Erriesha are available, you may also meet them at that time if you hadn't already. If they had a 10 star rating system they would get 10 stars from us. My mother has been a resident in the Memory Care wing of New Hope Valley since February 2016. I only have sincere praise and respect for the staff and this facility. I could not have asked for a better place for my mother, and have such peace of mind knowing she is in such good, kind, capable care there - all the more so as I live far away, in another country. All of my mother's caregivers are so kind to and gentle with her and indeed, all the residents, even those who I've seen become verbally challenging and difficult due to dementia. No hint of impatience, not ever! Always gentle and respectful and smart. The caregivers do much more than the minimum or basic level of care with residents, regardless of a resident's specific situation. They all seem to genuinely care for the residents and, by extension, family members like myself who are primary caregivers and often stressed or worried about their vulnerable parent. They always keep me informed about any changes in my mom's diet, behavior and health, even though I live far away (Thank you in particular to Dori, Jeremy, Hannah, Angelica and Marquisa, for your emails and phone calls!). When I visit in person, they keep me updated well, too, and are all so consistently the most kind, capable and caring staff. I have seen how much they make my mom's life brighter, despite the many physical and cognitive challenges she is facing every day. The facility itself is also bright and cheery, not hospital-like, and staff seem to enjoy their work and the place in which they work. The food is tasty and nutritious and personally tailored to residents, and they are always organizing a variety of activities in which all residents, regardless of ability can participate, be active, and get much-needed social time (yet also respect their need for time alone, too; my mom is generally private to really shy, so they only nudge her gently so she isn't too much alone/inactive, but find a nice balance by giving her breaks, too, so she can feel safe - a real art). Whenever I talk to other residents and the relatives of other residents, too, they seem to share my view. It's a rare and heartwarming place in the world, the clear result of Rumi and his staff's excellent research into what makes a safe, good place for the elderly at all stages, and a testament to the staff's daily practice - work which from my perspective cannot be easy but which they make *look* easy because of their personal faith in and commitment to it. I highly recommend New Hope Valley, and especially so if you are looking specifically for memory care for someone at any stage of dementia/Alzheimers. Thank you for sharing your experience with New Hope Valley Assisted Living and Memory Care. Our community is committed to delivering superior resident-centered care and enriching seniors' lives. Part of our mission is to provide residents with dignified living in a nurturing home. We achieve this by selecting team members for their compassion, talent, and ability to bring joy to our residents. My siblings and I are most thankful that our mom is at New Hope. She seems happy, willing to participate in the various activities, and seems happy with the food. The staff is attentive to her needs and our requests. There are several staff that are outstanding in their care of all there. Although my father was a resident for only a short time earlier this year, my family and I were extremely impressed by all of the staff, quality of the facilities, and the overall care. Each care provider made it a priority to connect with my father and ensure he was comfortable. Dori was especially helpful to us and she is a true asset to the facility. All the staff we encountered were caring, friendly, helpful and competent. It seems like a good place to work (which helps make it a good place to live). Attractive facility. Very good food! We were concerned that there was no nurse onboard ( hopefully they have one now), but it did not prove to be a problem. Thank you for taking such good care of Mom. We were able to visit New Hope Valley, and the place was nice as well. It was a little cheaper that the one we chose, but their rooms are smaller that the other community. They do have activities, but my mom does not participate in them. They provide refrigerator, phone expense, and a TV. Everything has been really good at New Hope Valley, so far. They have a variety of different rooms. My mother is in a one-bedroom. The dining room is more restaurant-style. They have a lot of exercise options and games that they play. Thank you for sharing your kind words about New Hope Valley. We are very pleased that you recognize that we offer choices to our residents. The residents who live at New Hope Valley are indeed our family. Thank you for letting us care for your mother. My mother was a resident of New Hope Valley for 13 months. Making the decision on where mom should live wasn't an easy one but the support and love we have felt since day one made our choice so easy. They took care of her as if she was their mom. Every time I visited, they made me feel as if I was part of their family. Mom passed away on November 9th. Her last few days were rough but again the staff took care of her and my family. It was overwhelming and beautiful to watch the staff come to her bedside and say their final goodbyes, sometimes staying with us to pray or sing to her. My family will always be indebted to everyone at New Hope. They are now and will always be part of my family. When faced with the heart wrenching decision of having to move Mom, who suffers from dementia, from her home, I had such sadness in my heart, sleepless nights, and high anxiety. My brother and I made a list of Assisted Living places that had Memory Care. At the top of the list was New Hope Valley. It was new and a convenient distance from our homes. We came armed with many questions and our observing eyes. The main things we wanted for Mom were a caring, knowledgeable, and personable staff; a small ratio of caregivers to residents; communication; safety; and cleanliness. But most of all, we wanted Mom respected and to have her dignity. These criteria were and still are being met at New Hope. Mom adjusted better than we thought. She is happy. She has met and made friends. There are daily activities and exercising, outings to various places, church services, and family dinners. New Hope Valley is Mom's new home. She is happy and there is peace of mind that she is well cared for. We appreciate your kind words and we will continue to strive towards making your mothers stay here at New Hope a great experience. We are glad to hear that your mother’s transition was smooth and that she has made new friends. New Hope Valley is our resident’s home and we would like to keep that homey feeling to make the transition just that much easier. We have focused on building a team of compassionate, professional individuals, and constantly strive to ensure that our staff members are aware of our residents’ needs. In June I moved my mom into New Hope Valley for "temporary" post-rehab care following a fall and pelvic fracture. Instead, we've decided it's a great permanent choice! We love New Hope Valley, its owner/developer Rumi S., and all of his caring and well-trained staff! We like it so much my dad will now join my mom to live there. Comparison visits to plenty of other area facilities and discussions with residents and family were the validation we needed to confirm that our decision for NHV was the best one. With a responsive local owner who really cares about his residents' satisfaction, you'll love your NHV experience, too. We were looking for a assisted living community for my mother, she did not live far from New Hope so we checked it out. We were so excited how beautiful it was, how nice everyone was and all the services they offered. We wanted to make sure Mom knew she was not moving to a Nursing Home but a community with people her age who needed assistance in daily living like she did. She has made many new friends and is now more active than she was at home. They assist you in any way they can. So 6 months later when I needed an assisted living community for my mother in law, I immediately chose New Hope, they treat my mothers as they would their own mothers. They have assisted us with all the challenges that have come up and I have never found an unpleasant worker, They have outings, activities for everyone. I would highly recommend New Hope if you want to feel comfortable and know your parent is well taken care of. Thank you for sharing your kind words about on the New Hope Valley Staff! We are very pleased that our hard word is recognized by the families of New Hope Valley. The resident who live at New Hope Valley are indeed our family. Thank you for letting us care for your mother and mother-in-law. New Hope Valley Assisted Living was smaller than what my mother has now. The staff was very nice. They had the same type of system where they keep the medicine locked. They order all the medicine and dispense it. The rooms were very clean. They came furnished. We also visited New Hope and they didn’t have any availability at that time. The staff seemed to be fine although not as friendly as the other facility we've visited. I saw their room and the closet area was really small. The dining room was practically everything, but it wasn’t really fancy. When we had to move mom into a new assisted living facility, I automatically knew where I wanted her to go. After visiting and touring the site, talking to staff members, it only reaffirmed our family decision to move her to New Hope Valley. We haven't been dissapointed a tiny bit. The entire staff is so warm and welcoming and are up to snuff on my moms present condition and situation and knowing she is safe at night, helps me sleep at night. Thank you Hope Valley Staff! Your awesome!!! Thank you for sharing your positive feedback on the New Hope Valley staff! We have focused on building a team of compassionate, professional individuals, and constantly strive to ensure that our staff members are aware of our residents’ needs. It is wonderful to hear that our hard work is recognized by the families. We are delighted that you are able to sleep at night with the knowledge that your mom is in good hands here at New Hope Valley. I wanted to express my heartfelt thanks for making my bridge party such a wonderful success! It was perfect in every way. Everyone on your staff contributed and also deserve recognition. From Dan and his kitchen crew to the girls that spruced up my room. They all worked very hard. The menu and food were great! As a result, they want to return once a month to play here, which means a lot to me. I can't imagine it being any better. Thanks Again! Thank you for your kind words Ellen! We work hard to find staff members who go above and beyond for our residents, and it is so rewarding to see the joy it brings. We are thrilled that your friends have decided to join you here at New Hope Valley each month for the bridge club party, and look forward to many bridge club parties in the future. When we visited New Hope Valley for the first time, my brothers, husband, and I knew we had found our Mom's next home. The facility is less than one year old, but the plan and design for it was a long time in the making. The care and thoughtfulness that went into the building of New Hope Valley is evident at every turn. The staff is top flight; all were carefully selected for their skills and care for the folks with whom they work. We have found this true of each staff person we've met. There has not been a time any of our family have experienced that our Mom's needs are not being met. We feel very fortunate that New Hope Valley is now available in our community. We are so pleased to hear that our planning and dedication is being noticed in the community. We are carefully selecting our staff for their particular skill set and their contributions to create a warm atmosphere toward all aspects of care to our residents, family and visitors. We are very grateful for the comments and will continue to work diligently at maintaining the trust you have placed on us! Thank you and we hope that your mother continues to have a great experience New Hope Valley. The name is genuine! Besides Living up to its name New Hope. The facility and staff have been a Blessing to my mother and Family. I thought it would be a difficult transition going from independent living, to assisted living, but the comfort of the facility and staff have made my mother feel comfortable, as though she was at home with a new extend family! What a True Blessing! After visiting other facilities I was completely satisfied with the facility New Hope Valley, was by far the Best decision for my loved one, my mother! We appreciate your kind words and we will continue to strive towards making your mothers stay here at New Hope a great experience. We are glad to hear that your mother’s transition was smooth and an enjoyable experience. We are happy to have your mother as part of our New Hope family. Each of our residents reminds us every day the reason we try to strive for excellence. New Hope Valley is our resident’s home and we would like to keep that homey feeling to make the transition just that much easier. With our dedicated staff as well as visiting families and friends, we try to keep the atmosphere here at New Hope as positive and upbeat as it can be. My mother has been in the "memory unit" at New Hope Valley for about a month now. I had many questions and concerns about transitioning my Mom to this new facility. She is in a later stage of Alzheimer's and I needed lots of reassurance about the philosophy of care and the staff before making this choice. Rumi, the director, was incredibly patient and informative, answering all my questions. Fortunately it has been a wonderful decision! Each staff member has been warm, welcoming, engaging and you can feel their commitment and the love of their work. It was a huge relief to see my Mom adapting to the loving interest and attention from the care providers so quickly. I could tell she felt more secure and knew she was going to get the help she needs. I feel really grateful, along with my whole extended family, that we have found this exceptional facility to provide such conscious and excellent care to my Mom. Thanks for your feedback Darla. We are delighted to see that your mom has had a smooth transition at New Hope Valley. Our goal has been to create an environment providing dignified living in a nurturing home, for our Residents. We have shared your feedback with our Care Partners. It means a lot to our care partners / staff that their work is recognized. Our Dad was the second resident at New Hope Valley. We thought it would be a big adjustment for him moving from an apartment where he lived by himself to an assisted living facility. We could not have been more wrong! He adapted to his new surroundings very quickly. It did not take long before he was calling New Hope Valley his "home". The administrators and care partners welcomed him wholeheartedly and made him feel like he truly belonged. My dad has always loved the outdoors and has been an avid hunter and fisherman for 67+ years. This has been such a big part of his life and who he is as a person. He was encouraged to bring whatever personal belongings he wanted to, including a couple of his deer mounts to hang in his new apartment. This meant the world to him. Everyone that works at New Hope has such a positive and caring manner about them. We are truly grateful for the wonderful care our dad is receiving. We highly encourage anyone looking for an assisted living facility for their family member or loved one to come and tour New Hope Valley. See for yourself why New Hope Valley surpasses all expectations. Appreciate your feedback Noelita and Cheryl. Glad that your dad is well adjusted at New Hope Valley. We see his passion for hunting and fishing and are glad to see that he is able to share it with fellow residents and staff. We strive to create a "home" like atmosphere where our residents can share their life's journey of life with others and it great to see that this working out well for him. As a daughter of a resident, I am extremely pleased with the care of my mother. The caring staff have gone beyond our expectation to help care for my mother as she experiences the last stages of Alzheimer. Many have come in on their days off to ask about my mom. New Hope is the most accommodating, caring and supported assisted living/memory care facility. We are really glad to see that New Hope Valley has worked out well for your mom's needs. We feel that our community's new construction and amenities are useful, but it is the care partners / staff and their devotion to what they do, that makes us who we are. We appreciate your feedback have shared your response with our care partners / staff. This is a kind and caring place that goes beyond the normal care that we were used to in an assisted care facility. I would recommend New Hope to anyone who is looking for an assisted care facility. Thank you for your feedback. Our care partners and staff strive to create an environment that celebrates the journey of life our residents and appreciate your recognition. We are family members of New Hope Valley's first resident. We are grateful for the extra-ordinary care that is being provided to our father. We selected New Hope Valley because there is a predominant philosophy of providing care that is based on the individual's needs and interests. The careful selection of staff members is very evident. From administrative staff to front line care partners, one can readily feel their committment to "making things work" for the resident. I was also impressed with the amount of research that was done by Rumi to insure that this facility will offer the best and latest technologies that will support their care philosophy. I can further say that our experiences with New Hope Valley has been nothing but positive. New Hope Valley is a treasure waiting to be discovered, and we are truely grateful that it is right here in our Great Lakes Bay Region. Appreciate your kind words, Jerry and Bev. It has been great to see your dad's progress over the past three months as he has settled into New Hope Valley. We strive to create an environment that celebrates the rich tapestry of life experiences of our residents. Our care partners / staff would be delighted to see your feedback. My mother moved into New Hope Valley and it's very pleasant there. My mother wants to go home, but she likes it there for the most part. The food is pretty good, and they have lots of activities. The grounds are very nice. Her room overlooks a pond, and during the spring and summer there's a fountain there. There's also a courtyard on the other side. Her room is small, but it's cozy; she has a bed and two chairs. The price compared to the one she was in, I guess it was reasonable. I haven't' tried the food, but it looks really good. Thank you for sharing your kind words about New Hope Valley Assisted Living & Memory Care. We are glad to hear that you mom has adjusted well to her move to New Hope Valley. The residents who live at New Hope Valley are our family. Thank you for letting us care for your mother. New Hope Valley offers an assisted living community unlike any other in MI, featuring an array of unique amenities and community events that promote a healthy and meaningful lifestyle as well as a care staff that is selected for their passion. Our memory care community supports those with cognitive issues. Here special care is taken to maintain an environment that is healthy, stimulating, and safe. This relaxed community has 24 hour supervision, a secure premises, and is fully equipped to care for its members who have these unique needs. New Hope Valley offers several floor plan options for residents. All floor plans include a kitchenette, a private bathroom, a dorm-size refrigerator, wireless internet, and Large flat-screen LED TV with cable television, among other amenities. 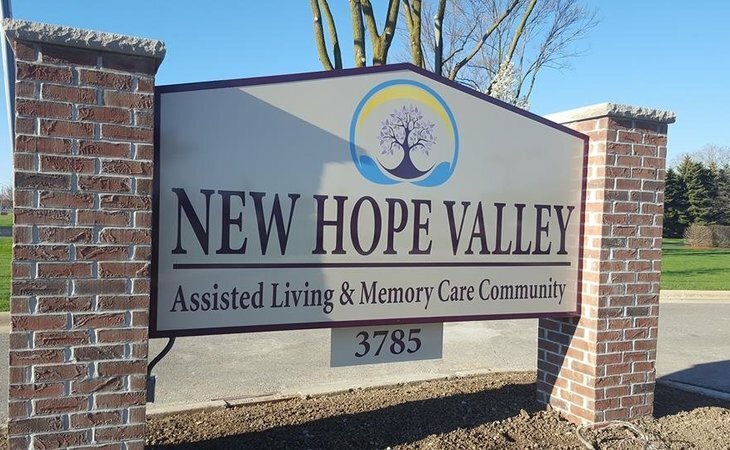 New Hope Valley offers “all inclusive” care communities. All-inclusive pricing means that all of a resident’s personal care costs, amenities, and charges are included in our monthly price. No surprises! What should caregivers and potential residents know about New Hope Valley?